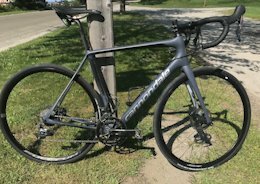 Cannondale Synapse SE Apex 1X (54) - For Sale! 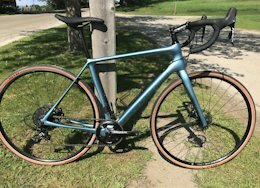 Cannondale Bad Habit 2 Carbon S - FOR SALE! Great bike, lightly ridden. Willing to meet anywhere between CT and VT! Full spec is below: FRAME Bad Habit 27+, 120mm, BallisTec Carbon, SmartForm C1 Alloy swingarm, Carbon Link, PF30, Flat Mount Brake, Pivoting Der Hanger, 1.5 Si headtube FORK RockShox Pike RC 120mm, Solo Air Spring, Charger Damper BOOST 110x15, Maxle Stealth, 51mm offset REAR SHOCK Fox Float DPS Performance EVOL SV, 3 Position Adjust RIMS WTB Scraper i40 TCS 27.5", 40mm inner, Tubeless Ready HUBS Formula 110x15 w/30mm end caps front, Custom DT-Swiss 370, 148x12 Ai Offset dish - rear straight pull 28 hole rear. SPOKES DT Swiss Competition TIRES Maxxis Rekon 27.5x2.8" 120 TPI, 3C, EXO Protection, Tubeless Ready PEDALS Not included CRANK Cannondale Si, BB30 w/ Ai SpideRing, X-Sync®, 30t BOTTOM BRACKET Cannondale Alloy PressFit30 CHAIN SRAM GX Eagle w/ Powerlock, 12-speed REAR COGS SRAM 1275 Eagle 10-50t, 12-speed REAR DERAILLEUR SRAM GX Eagle, 12-speed SHIFTERS SRAM GX Eagle 12-speed Trigger HANDLEBAR Cannondale C3 riser, Alloy, 4° upsweep, 9° backsweep, 760x15mm GRIPS Cannondale Lock-On STEM Cannondale C1, 6061 Alloy, 60mm, 31.8, 5° HEADSET Cannondale HeadShok Si BRAKES SRAM Guide R, Centerline Rotors, 180/180mm BRAKE LEVERS SRAM Guide R SADDLE Fabric Scoop Shallow Elite SEATPOST RaceFace Aeffect Dropper, 31.6mm, 125/150mm travel. Willing to meet part way in CT or Vermont. Great 29er trail bike used for a season. 120mm of travel in the front and 115mm in the rear. This bike is in great shape and has been professionally maintained. Full spec is below FRAME Scalpel SE, 115mm, BallisTec Carbon, Zero-Pivot seatstay, Carbon Link, PF30, 1.5 Si head tube, Ai Offset FORK Lefty 2.0 Alloy OPI, 2Spring, 120mm, PBR Isolated Damper Technology, 55mm offset (29), 50mm offset (27.5) REAR SHOCK Fox Float Performance Elite DPS EVOL SV, 3 Position Adjust 115mm Travel RIMS Stans NoTubes ZTR ARCH MK3 28hole, Tubeless ready, 26mm inner HUBS Lefty 60 front, HollowGram by DT-Swiss 142x12 straight pull 28 hole rear (Ai Offset Dish). SPOKES DT Swiss Competition TIRES Maxxis Ardent 2.4"/ Nobby Nic 2.35", Dual Compound, EXO Protection, Tubeless Ready PEDALS Not included CRANK Truvativ Stylo Eagle 7K, 32t BOTTOM BRACKET Cannondale Alloy PressFit30 CHAIN SRAM GX Eagle REAR COGS SRAM 1275 Eagle 10-50t 12 speed REAR DERAILLEUR SRAM X01 Eagle 12-speed SHIFTERS SRAM GX Eagle 12 speed Trigger HANDLEBAR Cannondale C3 riser, Alloy, 4° upsweep, 9° backsweep, 760x15mm GRIPS Cannondale Lock-On STEM Cannondale C1, 6061 Alloy, 1.5", 60mm, 31.8, 5° HEADSET Cannondale HeadShok Si BRAKES Shimano XT hydro disc, 180/160mm BRAKE LEVERS Shimano XT hydro disc SADDLE Fabric Scoop Flat Race w/ Titanium Rails SEATPOST RaceFace Turbine Dropper, 31.6mm, 125/150mm travel. 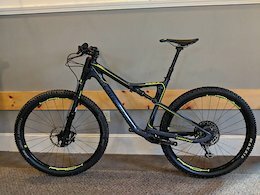 Cannondale Bad Habit 2 Carbon M - FOR SALE! Willing to meet part way and can meet at a location in: Vermont or CT, some areas of Mass/NH/NY This bike is in great shape and has been used lightly for just a season! It has 27.5 plus wheels so it is very confidence inspiring. Full spec is below: FRAME Bad Habit 27+, 120mm, BallisTec Carbon, SmartForm C1 Alloy swingarm, Ai offset, Carbon Link, PF30, Flat Mount Brake, Pivoting Der Hanger, 1.5 Si headtube FORK RockShox Pike RC 120mm, Solo Air Spring, Charger Damper BOOST 110x15, Maxle Stealth, 51mm offset REAR SHOCK Fox Float DPS Performance EVOL SV, 3 Position Adjust RIMS WTB Scraper i40 TCS 27.5", 40mm inner, Tubeless Ready HUBS Formula 110x15 w/30mm end caps front, Custom DT-Swiss 370, 148x12 Ai Offset dish - rear straight pull 28 hole rear. SPOKES DT Swiss Competition TIRES Maxxis Rekon 27.5x2.8" 120 TPI, 3C, EXO Protection, Tubeless Ready PEDALS Not included CRANK Cannondale Si, BB30 w/ Ai SpideRing, X-Sync®, 30t BOTTOM BRACKET Cannondale Alloy PressFit30 CHAIN SRAM GX Eagle w/ Powerlock, 12-speed REAR COGS SRAM 1275 Eagle 10-50t, 12-speed REAR DERAILLEUR SRAM GX Eagle, 12-speed SHIFTERS SRAM GX Eagle 12-speed Trigger HANDLEBAR Cannondale C3 riser, Alloy, 4° upsweep, 9° backsweep, 760x15mm GRIPS Cannondale Lock-On STEM Cannondale C1, 6061 Alloy, 60mm, 31.8, 5° HEADSET Cannondale HeadShok Si BRAKES SRAM Guide R, Centerline Rotors, 180/180mm BRAKE LEVERS SRAM Guide R SADDLE Fabric Scoop Shallow Elite SEATPOST RaceFace Aeffect Dropper, 31.6mm, 125/150mm travel.